I am looking for some advise on the new tarmac frame size. I am just below 5'7 (169cm ) of height with a 29.5" leg Inseam and would like to hear some recommendations on which size to buy. I like to be aggressive but comfort is a priority as well for those 80-100 mile rides. Last week, I had the opportunity to demo a 52cm at my LBS which felt good, but they didn't had a 49cm to compare. Also I would like to hear suggestions for stem size's for both the 49cm or 52cm taking into consideration that I ride my bikes with slammed stem. On another note I will like to point out that I used to own a 2015 tarmac size 52 and I like it a lot, but always had the doubt if I would had been better on a 49. Also I might be wrong, but I feel that the SL6 frame feels smaller than the SL5, which makes me think if the SL6 49cm frame will be too small for me. I would definitely think a 52cm still. I'm on a 52 SL5 at 5'9" and concerned that the new one will be slightly small. I went from a 52 to 54 Allez Sprint after finding the Sprint just a hair small in the 52. If a 52cm felt fine, then get that. You won't really be able to get very "aggressive" on it unless you go -17deg or are comfy with bendy elbows. I ride a 54cm H1 Emonda and I'm 5'10"
I have similar measurements to you and a 52cm fits great. You could get your stem a bit lower on the 49cm, but you can always get a -17 degree stem. I'm coming over from an Allez Sprint and it had a short headtube. Instead of the normal -6 degree stem, I went with a -12 on the Tarmac. Am 5’5” - running a 52cm. Stem is 100mm. Handlebar reach is 80mm. Just one one cm spacer plus headset cap. Comfortable and aggressive enough. Do choose handlebar carefully though. I'm 5' 8" have shorter legs with a longer torso. My bb to top of saddle height is 682. I used to have a 2014 SL4 49cm Tarmac and currently own a 52cm SL5 Tarmac. On the 49cm Tarmac, I ran a 5mm spacer and a -7 130mm stem but on the 52cm, I run a -17 130mm without any spacers. The positions are very comparably between the two. I probably would have purchased another 49cm but the shop had a good deal on the Sagan WC Tarmac comp in 52cm so I went with that frame. I knew that I would have to slam the 52 to get the handlebars as low as what I had them on my 49cm but it worked out ok.
For the SL6, the 49cm has 5mm less reach and 13mm less stack height, which means there isn't a huge different between the two. There's two ways to approach this. If you want to ride in a more aggressive position, I would buy the 49cm, especially if your 52cm was slammed. If you find that your position is too aggressive on a 49cm, its easy to raise your handlebars through a spacer or a less aggressive stem. If you feel like the 52cm you rode could accommodate the lowest position you would ever want, I would choose that over a 49cm but if your setup on a 52 is already slammed, it's about as low as you'll ever be. I think you'd be fine either way depending on how aggressive you want you're position to be. Whats your bb to top of the seat saddle height? My BB to saddle is 68cm (680). ichobi the bikes looks really cool. whats your BB to saddle height? shoerhino wrote: I'm 5' 8" have shorter legs with a longer torso. My bb to top of saddle height is 682. I used to have a 2014 SL4 49cm Tarmac and currently own a 52cm SL5 Tarmac. On the 49cm Tarmac, I ran a 5mm spacer and a -7 130mm stem but on the 52cm, I run a -17 130mm without any spacers. The positions are very comparably between the two. I probably would have purchased another 49cm but the shop had a good deal on the Sagan WC Tarmac comp in 52cm so I went with that frame. 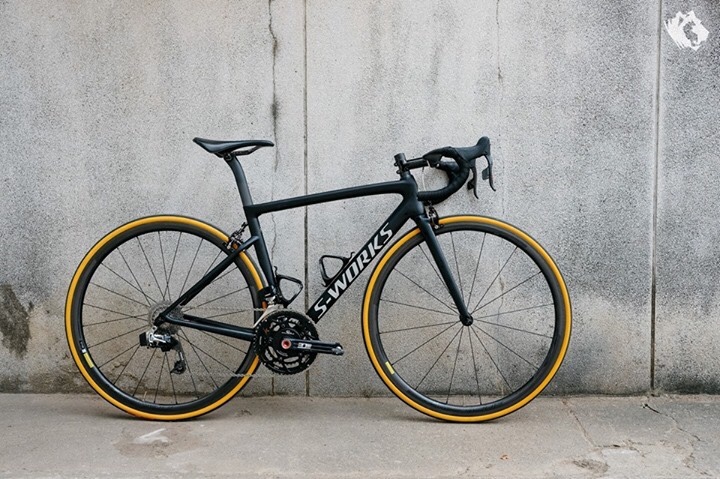 I knew that I would have to slam the 52 to get the handlebars as low as what I had them on my 49cm but it worked out ok.
One other question, what stem length do you have on you 2015 52cm tarmac and what angle is it installed at? shoerhino wrote: One other question, what stem length do you have on you 2015 52cm tarmac and what angle is it installed at? I had a 90mm stem that came with the bike. the angle I am not sure. I could have used a 100 or 110 stem as the saddle was all the way back and correct me if i wrong. Here is a shot of my bike. 662mm saddle height. Quite a bit lower than yours, but I've had a few bike fits and this is where we landed. 110mm stem with -12 degree rise. 10mm spacer on top of the headset cap. I could probably slam it, but I want some more rides outside to determine that. sun wrote: Here is a shot of my bike. 662mm saddle height. Quite a bit lower than yours, but I've had a few bike fits and this is where we landed. 110mm stem with -12 degree rise. 10mm spacer on top of the headset cap. I could probably slam it, but I want some more rides outside to determine that. I think it looks nice!. Just to confirm that is a 52cm frame?. I'm 170 cm and ride 49 cm SL5. I've seen some US Tinkoff rider rode SL4 in 49 cm too and he was 173 cm high. I have 2 cms of spacers under the stem, but the new frame has a higher head tube. I'd go with 49 for sure. ak47 wrote: I'm 170 cm and ride 49 cm SL5. I've seen some US Tinkoff rider rode SL4 in 49 cm too and he was 173 cm high. I have 2 cms of spacers under the stem, but the new frame has a higher head tube. I'd go with 49 for sure. What stem size do you use?.